Looking for a flexible way to fit a scuba certification into your busy schedule? Or you just prefer web based learning, PADI’s Scuba Diving Digital courses are the way to go. You can complete your home study phase of your PADI Scuba diving courses online with eLearning format on a PC or MAC or offline with the Touch® format on a Tablet or iPad. PADI eLearning or Touch? How do I choose? Signing up for your scuba class is easy! Click on the link below for the course you want and you are on your way. Or call your dive buddies at Adventure Scuba and we’ll arrange for you to receive your code via email. Start here to learn to scuba dive. PADI Open Water Diver Course- Touch Version – choose this option if you want the flexibility of being able to study online or combination of off-line and online. The Touch course can be completed on a tablet, iPad, PC or MAC. PADI Open Water Diver- eLearning Version – This option can be completed on a computer with internet access. PC or MAC is fine. When you are ready, contact Adventure Scuba to schedule your pool and certification dives. Prefer a more traditional class? Prefer a good ole fashion book? No problem! Contact us and we can arrange that. PADI Advanced Open Water Diver Course Online – Take the next step on the way to Master Diver. 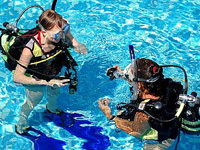 Your Advanced Open Water course introduces you to a variety of different types of dives. PADI Enriched Air Nitrox Course Online – The most popular PADI specialty. As a Nitrox diver, you can take advantage of the benefits of diving Enriched Air. Digital Underwater Photographer– Learn to take great photos to share with your friends. Rescue – “Challenging” and “rewarding” best describe the PADI Rescue Diver course. Most divers find this course both demanding and rewarding, and at the end, say it’s the best course they’ve ever taken. Divemaster – the first step to becoming a PADI professional. Scuba Tune Up – Keeping your skills fresh will increase your enjoyment of your sport. This is available for scuba divers any recognized scuba certification. 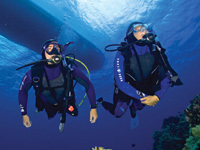 Certifications for each course require pool or open water dives. Contact Adventure Scuba for details and to schedule and pricing.